For ten generations the Nolet family has been producing some of the most premium, high quality dry gin available in the world. 300 years of heritage, expertise, and craftsmanship have culminated in one of the finest spirits money can buy. Founded by Jon Lucasse Nolet, his vision for a deep family legacy lives on to this day through Carolus Nolet, Sr, whose own dream for the family legacy spurred him to craft two gins of great notoriety for the 21st century. One of his products is none other than a classic Silver Dry Gin. 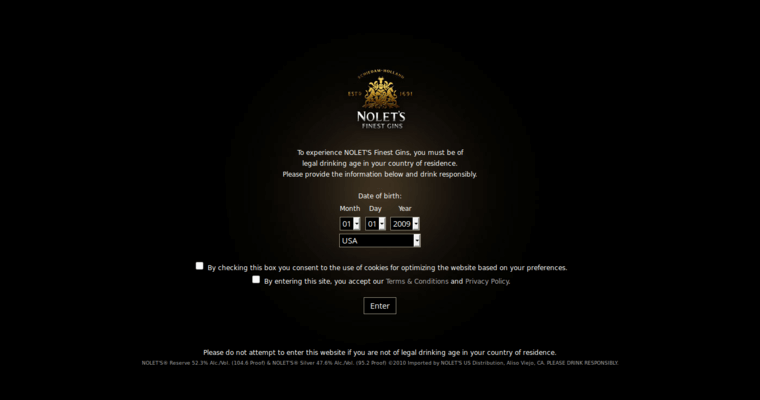 At 95.2 proof, Nolet's Silver Dry Gin is the new standard for quality gins. With botanical infusions of raspberry, peach, and Turkish rose, this premium gin has an all natural, distinct aroma, and a fruity, floral taste. Designed specifically for the modern, emerging generation of gin drinkers, Nolet's Silver Dry Gin is a product that stands above the rest.